Like all new parents, my wife and I are trying to work out how to manage our lives now that we have a baby. Even seemingly simple tasks, like going to the shops or visiting relatives, now feel like a major logistical undertaking. Resuming our regular trips to our local climbing wall felt like a particular challenge. Such a trip would involve ensuring baby Leo is happy and safe in an environment not designed for babies while, at the same time, ensuring both Valerie and I enough of a chance to climb. In the end, we managed the trip and Leo really enjoyed himself, but the little guy eventually hit a wall and crashed out on a bouldering mat. It had been four months since Valerie last climbed and she really wanted get back to it. Going to the climbing wall isn’t just a matter of Valerie being able to do something that she loves. It’s about Valerie getting fit again and escaping the house during her maternity leave. We also hope that climbing is an activity we can do as a family when Leo is a bit older and seeing climbing when he is young might help him when he first has a go climbing. All this means keeping up regular climbing wall sessions. The slight problem is that climbing walls aren’t usually built with babies in mind. 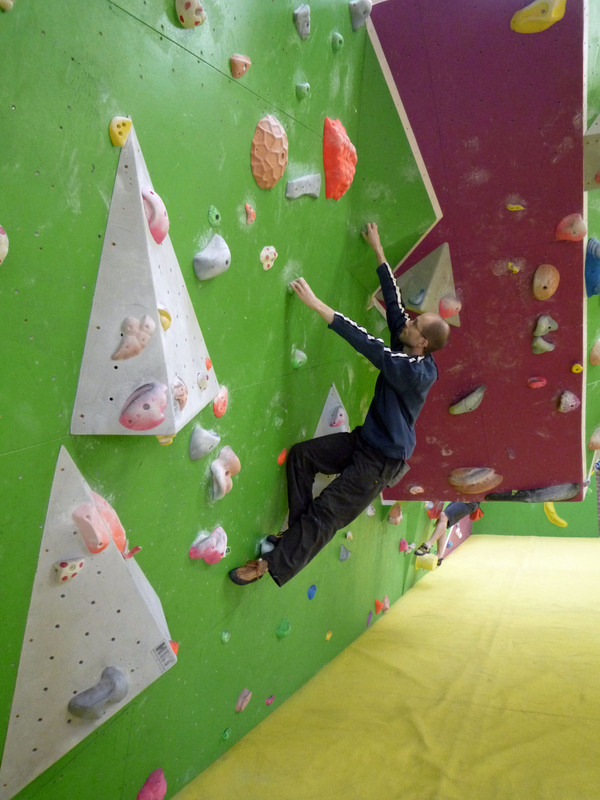 Our local climbing wall is pretty child-friendly, with easy bouldering walls, a child-only tunnels section and classes for kids. However, there are no baby change facilities and the climbing is spread over several levels connected by stairs. It’s because of these flights of stairs that we ruled-out taking Leo in the buggy and leaving him in it while we climbed. We’d seen a couple of other parents do this, but if we did the same we’d be confined to the ground floor unless we felt like carrying the buggy around the multiple levels. So we took Leo to and from the wall in the Ergobaby carrier and then carried him around in our arms when at the wall. One of us would do a few boulder problems, while the other would look after Leo, and we would then swap. When it came time to change Leo, Valerie did it on a portable changing mat on bench in the ladies’ changing room. Valerie and Leo relaxing at the climbing wall’s cafe. It all worked pretty well. 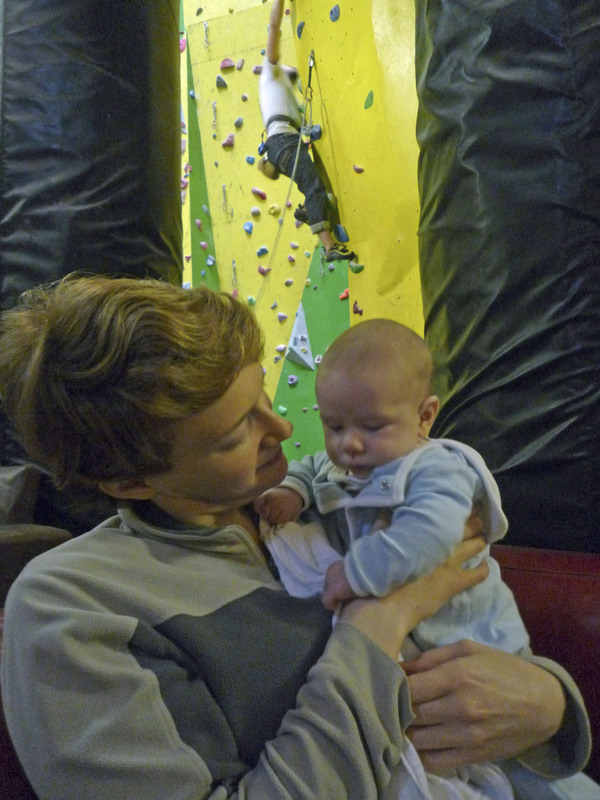 Leo was fascinated by all the colourful sights and new sounds and enjoyed looking at his Mummy and Daddy climbing. Climbers are also usually a friendly bunch and they are particularly so when there is a cute (I’m not biased – it’s been confirmed by others that he’s cute) and sociable baby to say hello to. However, with a tummy full of milk and having a busy morning in a stimulating environment, Leo started to get sleepy quickly after lunch. As we carried him up to the mezzanine level, Leo crashed, falling asleep in Valerie’s arms. We laid him down on a bouldering mat, away from the walls, and took turns on Leo guard duty. Leo asleep on a bouldering mat. It looks like Leo’s comfortable with climbing walls and that we can successfully manage the logistics of a climbing wall trip. Our little family will be going back. Climbing is a risky activity. 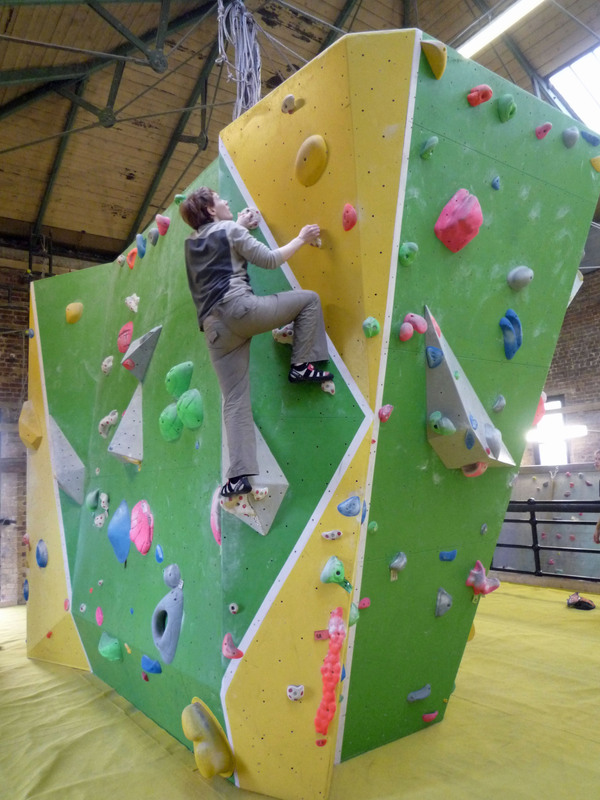 There are plenty of opportunities for accidents and injuries at climbing walls if you don’t follow the rules of the wall and good practice. When we went to our wall we took great care to ensure Leo was kept away from where people might fall on him or otherwise knock into him. 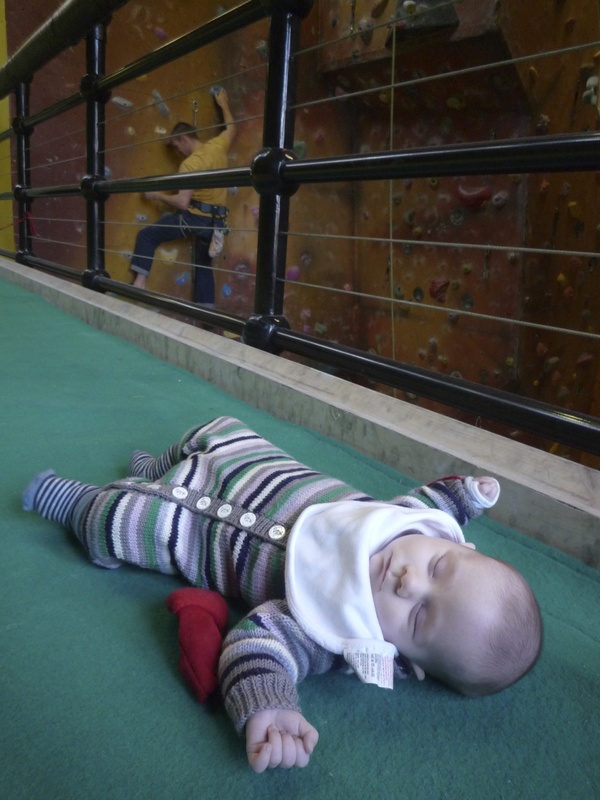 Whether you take a baby or young child to a climbing wall is your choice and at the discretion of the individual climbing wall, but, if you do go, please be careful. Congrats on your lovely little baby! Life is full of so many things. Thank you. He is wonderful. My wife and I feel really lucky. He doesn’t seem much interested in indoor climbing,not yet! Congratulations,i wish him the highest peaks in his life. I’m hoping he’ll get interested – it’ll be a fun thing to do with him. I’ve always enjoyed bouldering. It’s a lot of fun. Wishing many more fun family outtings. Thanks. The little guy really likes his outings to the wall. We’re hoping that he climbs before he walks (like his mum). Lovely to meet Valarie and Leo a few weeks ago. Thank you for the link suggestions regarding diastasis rectifi they have been very useful. Just to let you know there are baby change facilities in the disabled toilet opposite the bike park area. Wow – I never knew that, thank you! We never go down that way… That’ll definitely make things easier. I’m glad the links have been of use. I hope you’re back climbing very soon.